Microgaming is one online casino gaming provider giant that has forayed into mobile gaming, but some of its desktop based games are also worth trying. One such prominent example is Bullseye. Microgaming is one online casino gaming giant that has forayed into mobile gaming, but some of its desktop based games are also worth trying. One such prominent example is Bullseye. The slot is based on the popular 1980s television show in which, ace Comedian Jim Bowen played the host. The game has a predominantly black background on which, the characters and visual elements appear. The three characters Bully, Tony and Jim are present in the slot. The classic Bullseye music has been used to perfection. The prominent images used in the slot include cars, darts, speedboats and caravans, giving it a sleek look. 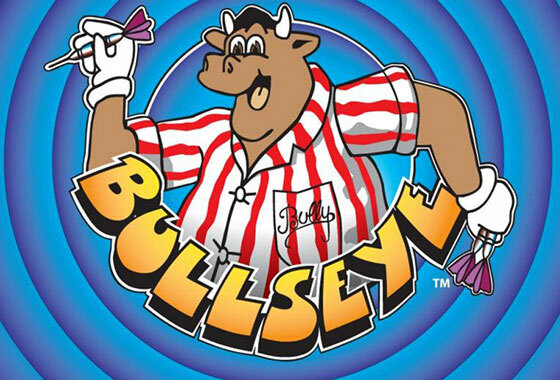 Bullseye, based on 1980s hit British television show, is a slot game based on darts. There are 243 ways to win and the game comprises of 5 reels. The minimum value you can play a spin for is only 30p. The maximum amount you can put on a spin is £15. This is a computer only game. In this slot, you may join the three characters aka Bully, Jim, Tony in a dart show and enhance your chances of winning big prizes. Bully is the main character in this exciting darts game. In this slot, you get access to two bonus features along with Bully’s Prize Board feature. The latter offers you 5 throws so that you get rewarded with cash prize. Besides, you get a Free Spins feature in which you get 30 free spins along with the wins doubled. The Bully’s Prize Board Bonus gets triggered by accessing the dartboard Bonus symbol on reel 5 and 1 at the same time. You get 5 throws which fetch a cash prize. This cash prize may range from 2 to 15 times of the amount you put as stake in the game. You get the chance to win up to 75 times of your stake. Now, how cool is that! The Free Spins feature gets activated by availing 3 or even more Free Spins symbols and this could be anywhere on the reels. You will get 15 free spins with a 2x multiplier. Even more spins can be activated, with the limit being 30. Bullseye offers adequate payout options with highest possible win being an enticing amount. When you want to play an online slot with simple gameplay and high payout chances, this is your slot. With its retro TV show theme, the game may appeal to the older folks!